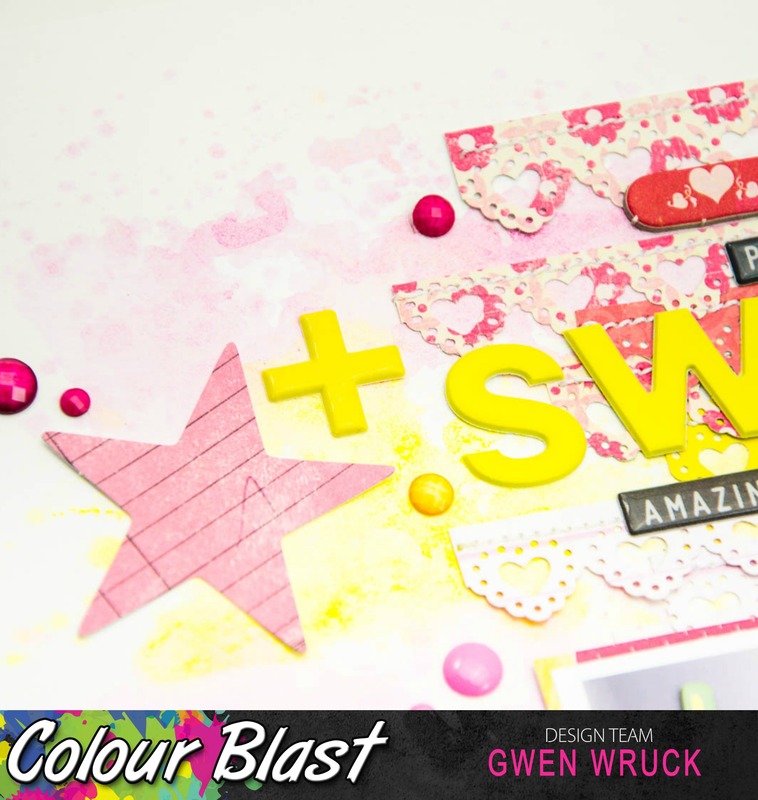 Super excited that it is my turn on the Colour Blast blog today to share this months Challenge! 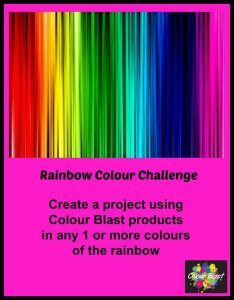 I love how the girls have put together a challenge each month to help us get inspired, use our Colour Blast products and maybe even win some more! 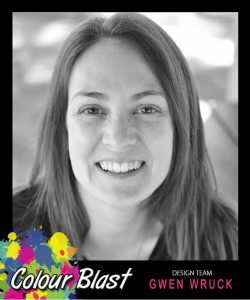 It is my turn to kick off the month by sharing my take! Can you guess what the challenge is? 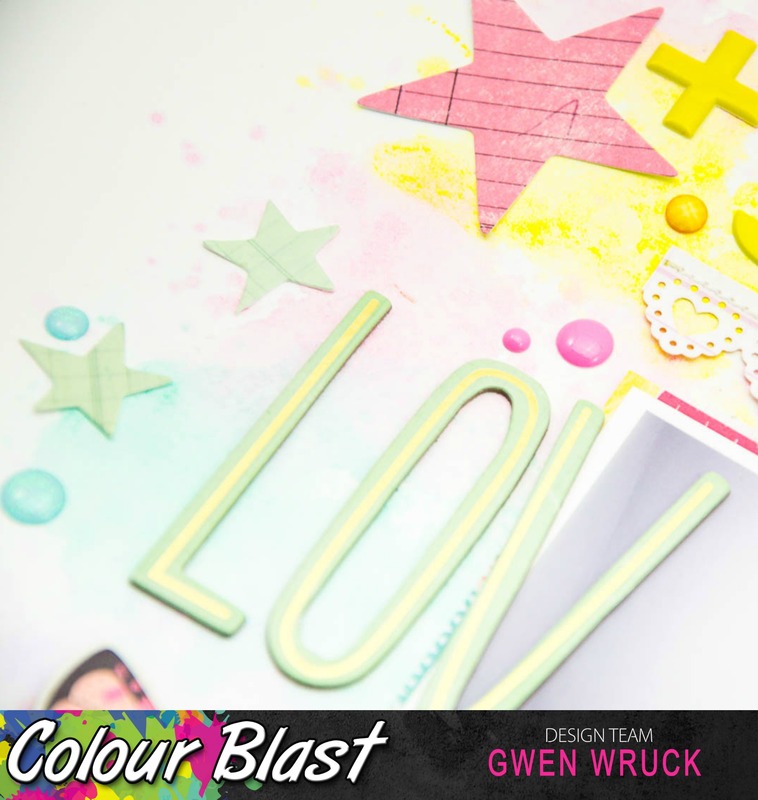 If you guessed, "be inspired by a Rainbow"... you were right! 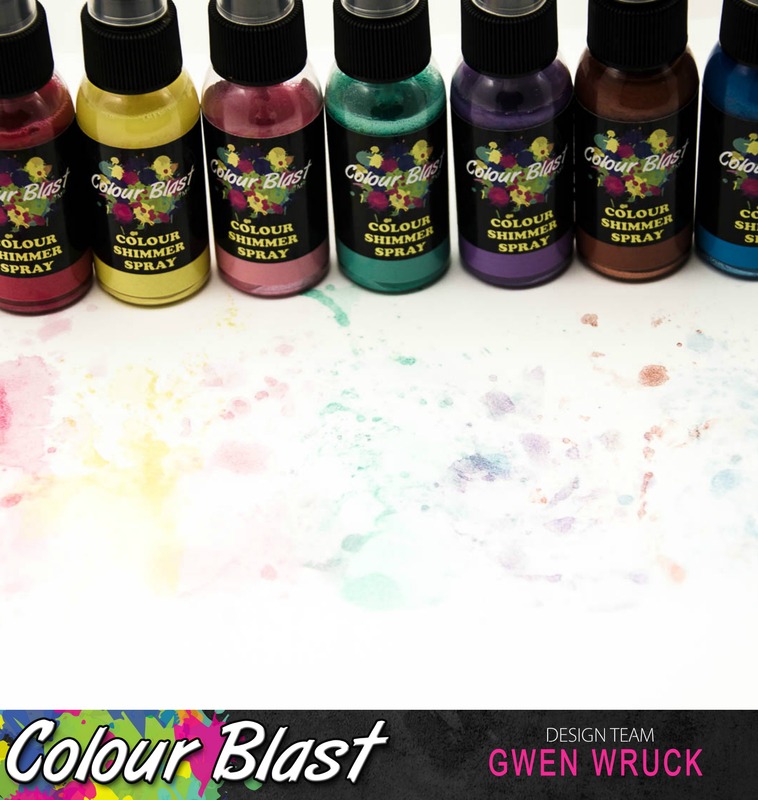 To start my page, I began by choosing a Rainbow of Colour Shimmer Sprays to work with. I went with Lipstick (Red), Sunshine (Yellow), Blush (Pink), Envy (Green), Lovely Lilac (Purple), Sienna (Orange) and Singin the Blues (Blue) - Don't they look pretty all lined up like that! I then used the packaging technique to lay down each colour along the left-hand edge of my page. I worked my way through the rainbow making sure each colour was dry before applying the next. I then began working through my stash to find coordinating papers to match my sprays. 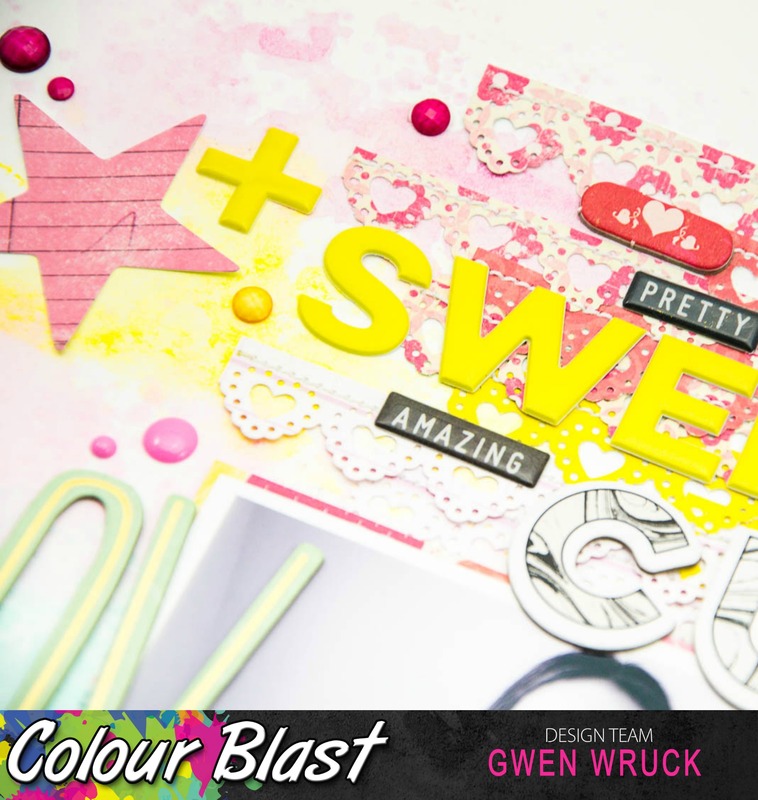 I started with my scraps which I punched with an edge punch to create lots of paper strips. Again, working with all of the colours of the rainbow, I laid them down on my page, this time towards the right-hand side. The spray and these paper scraps acted as the background for my page. Above you can see a close up of the pretty colours in the sprays. I love how applying them using this technique gives you a watercolour type look. Once I was happy with the placement of the paper strips, I stitched them all down. Next, I matt my photo with a colourful pattern paper and positioned that. Now it was time to go through my alphabet stash. I pulled out a heap of letters in coordinating colours to match my rainbow. 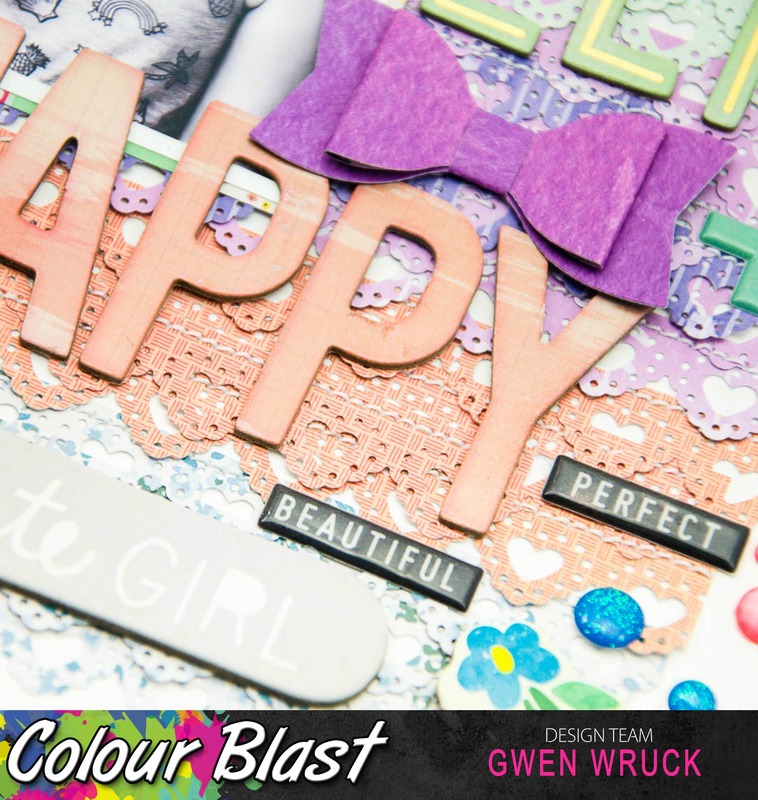 Some are chipboard word pieces such as the word "my" and "cute" and others are from alphabet sticker packs such as "sweet". I simply looked for words and letters that would match the colour of the sprays I had used. 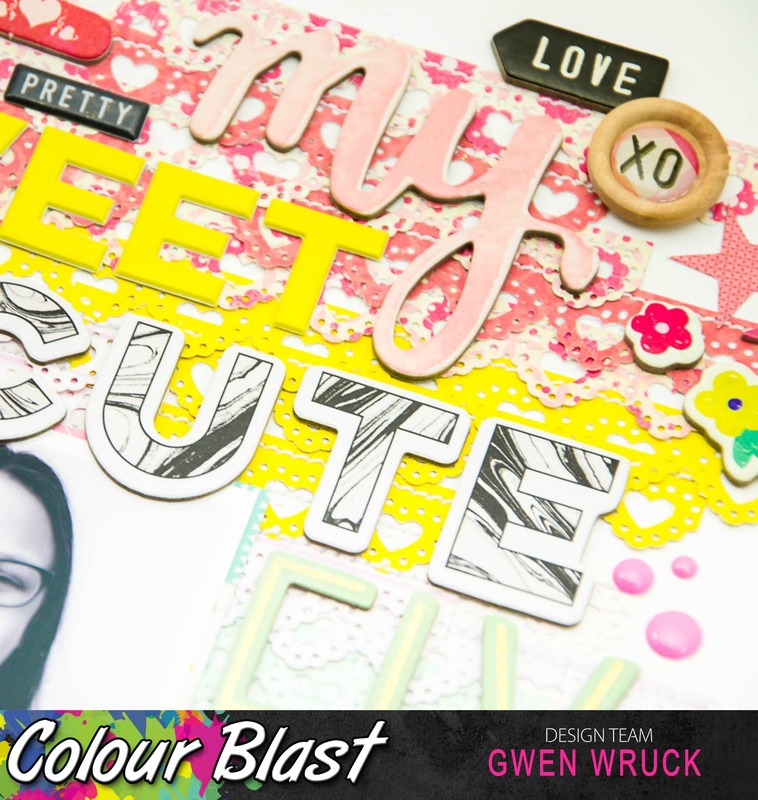 Now that I had my photo and words all locked in, it was time to add my embellishments. 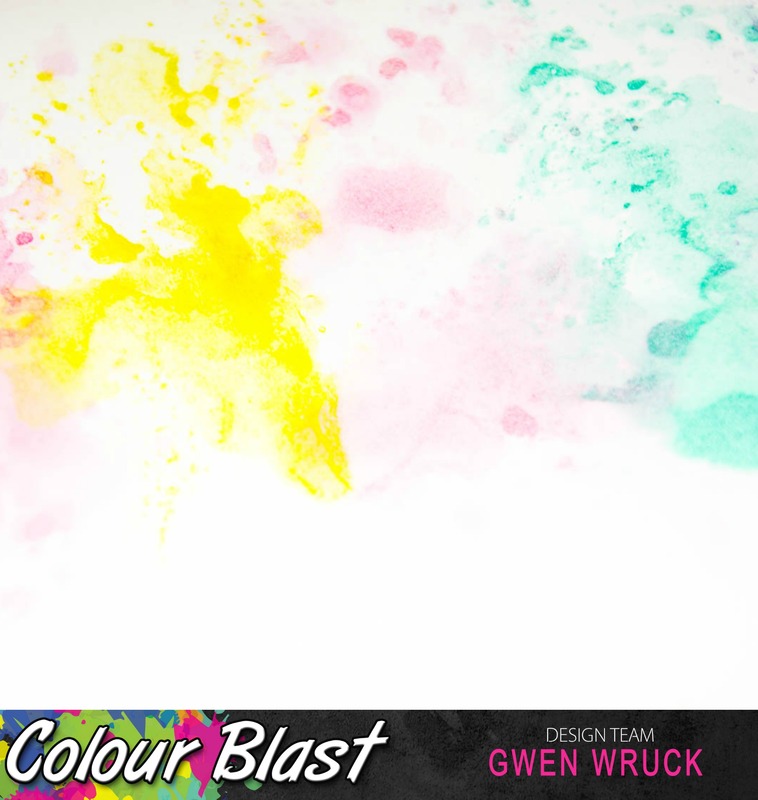 Again, I've stuck with the 'Colour on Colour' look searching for bits and pieces to match the Colour Shimmer sprays. Where I didn't have a pre-made embellishment to match, I made my own, such as the paper bow above created with a die cut through my Sizzix machine. To finish the page, I went through my Enamel Dot collection and found some in each of the colours to add. I know there are a lot of elements on this page, but I think I get away with it because they have been placed tone on tone and I just love how it turned out. I give this project a "mess level" of Low. Very little mess, super easy technique that I would recommend for a beginner. 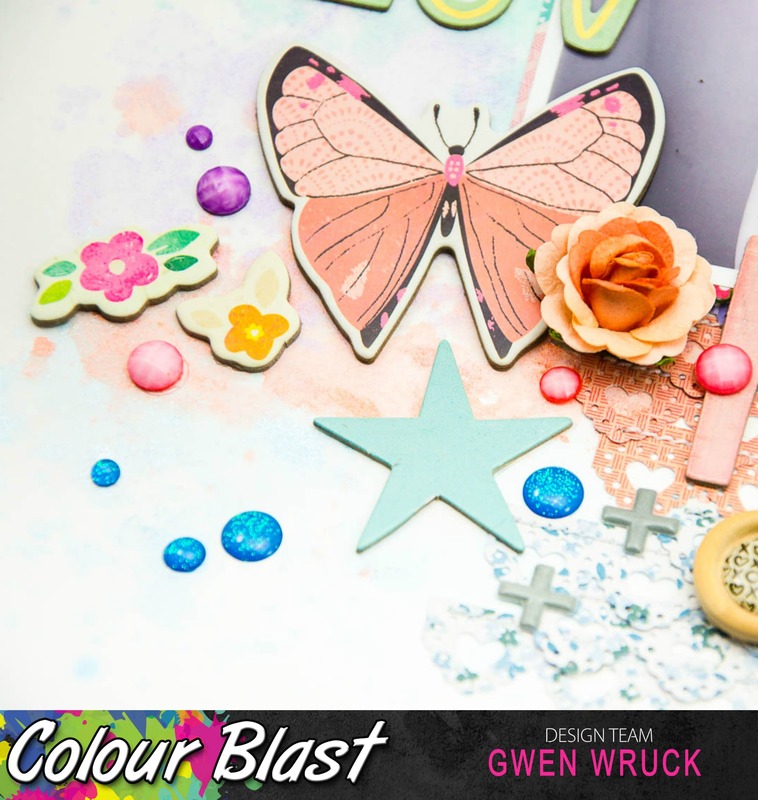 Thanks for popping by today, the challenge runs all month, so I hope this page inspires you to pull out your Colour Shimmer Sprays and create your very own Rainbow! 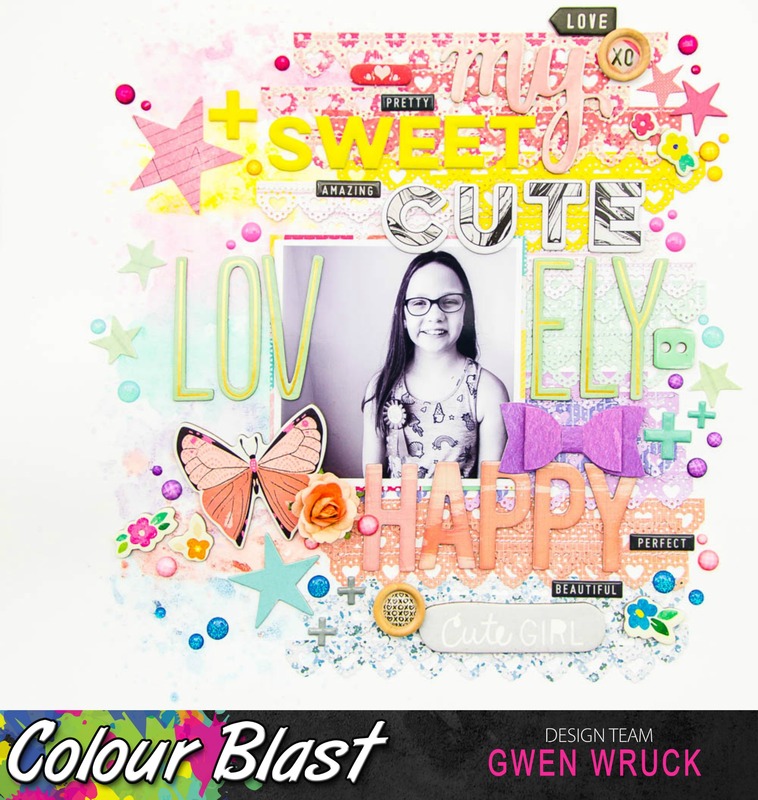 As always, be sure to share your creations, I really love seeing what you all make and you could win yourself some free product - who doesn't love that!